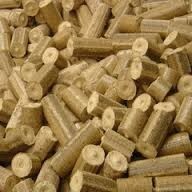 Compressed heat logs are made from a mixture of seasoned hard and soft woods. They are a very efficient fuel with up to a 3 hour burn cycle. Example a 6 Kw Aga stove at working temperature, 10 briquettes will burn for approx 6 hours. Full pallet of compressed wood logs 48 bags on a pallet each bag consists of 30/40 pieces approx 20kg shrink wrapped and delivered free anywhere on uk mainland. That's only £3.62 per 20Kg!